Home » Software » Connectify Hotspot Pro Full Version - Free Download! Connectify Hotspot Pro Full Version - Free Download! Connectify adalah software atau program aplikasi untuk membuat Wifi Hotspot melalui komputer Anda, dengan menggunakan koneksi internet Speedy ataupun Modem. Ini cara praktis membuat HotSpot WiFi tanpa tambahan alat apa pun! Cukup install saja! Pokonya, begitu komputer Anda koneksi ke internet (pakai modem ataupun Speedy), maka koneksi internet itu bisa Anda share atau bagi dengan orang lain, yaitu dengan Connectify ini! Anda bisa setting nama WiFi dan Passwordnya. Berikut ini Link Download "Connectify Hotspot Pro Full Version". Free!!! Gratis!!! Share 3G / 4G, boost Wi-Fi, and more with our software router, Connectify Hotspot, or combine all your Internet connections with Connectify Switchboard. Menurut Wikipedia, Connectify is a software company focused on developing networking software for consumers. 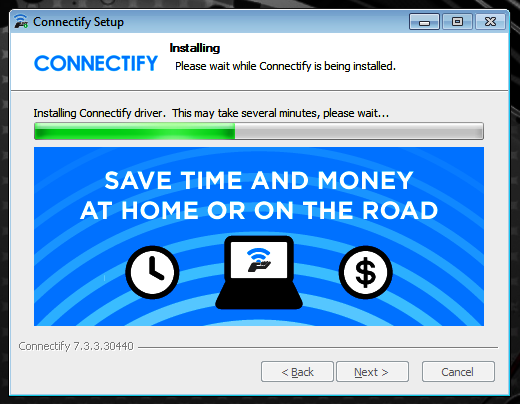 Connectify's flagship productConnectify Hotspot, is a software router for Microsoft Windows. Connectify also has more recently released Connectify Dispatch, a network load balancing solution for using multiple Internet connections simultaneously and Connectify Switchboard, beta software and switchboard server combination boosts internet speeds via cloud technology. Nah itu dia. Terjemahin sendiri aja ya....! Good Luck! 1 komentar on Connectify Hotspot Pro Full Version - Free Download!